Shiveluch (Kamchatka): (19 Mar) The activity at the volcano has been a bit lower during the past days, although overall similar to the past weeks. 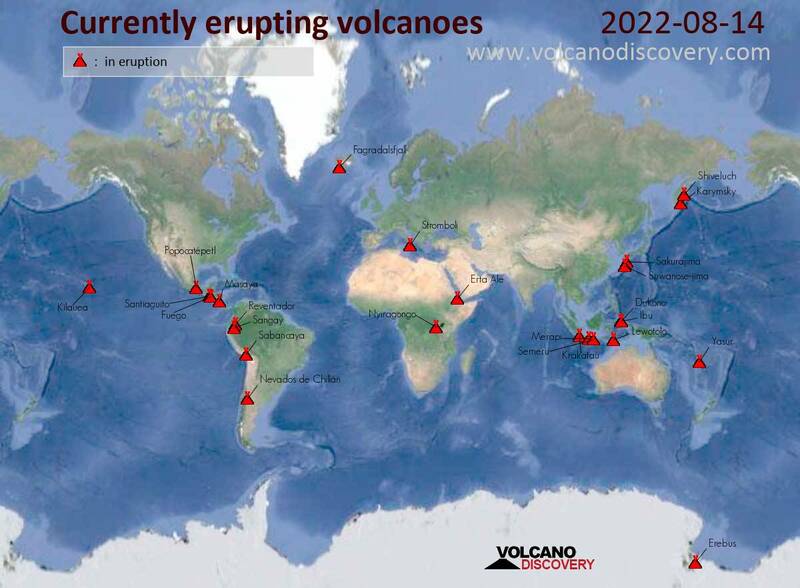 The lava dome continues to grow steadily. Manam (Papua New Guinea): Explosive activity continues. Volcanic Ash Advisory Center (VAAC) Darwin warned about a volcanic ash plume that rose up to estimated 15000 ft (4600 m) altitude or flight level 150 and is moving at 20 kts in SE direction. Explosive activity continues. Volcanic Ash Advisory Center (VAAC) Darwin warned about a volcanic ash plume that rose up to estimated 15000 ft (4600 m) altitude or flight level 150 and is moving at 20 kts in SE direction. Ibu (Halmahera, Indonesia): (19 Mar) Explosive activity continues. Volcanic Ash Advisory Center (VAAC) Darwin warned about a volcanic ash plume that rose up to estimated 7000 ft (2100 m) altitude or flight level 070 and is moving at 5 kts in SE direction. Explosive activity continues. Volcanic Ash Advisory Center (VAAC) Wellington warned about a volcanic ash plume that rose up to estimated 7000 ft (2100 m) altitude or flight level 070 and is moving at 10 kts in SE direction. Bromo (East Java, Indonesia): (19 Mar) Explosive activity continues. Volcanic Ash Advisory Center (VAAC) Darwin warned about a volcanic ash plume that rose up to estimated 12000 ft (3700 m) altitude or flight level 120 . Dukono (Halmahera): (18 Mar) Explosive activity continues. Volcanic Ash Advisory Center (VAAC) Darwin warned about a volcanic ash plume that rose up to estimated 7000 ft (2100 m) altitude or flight level 070 and is moving at 10 kts in SE direction. Kerinci (Sumatra): (19 Mar) Volcanic Ash Advisory Center Darwin (VAAC) issued the following report: VONA STATE ERUPTION TO FL150 MOV NE AT 19/0800Z. Popocatépetl (Central Mexico): Explosive activity continues. Volcanic Ash Advisory Center (VAAC) Washington warned about a volcanic ash plume that rose up to estimated 22000 ft (6700 m) altitude or flight level 220 . Sabancaya (Peru): Explosive activity continues. Volcanic Ash Advisory Center (VAAC) Buenos Aires warned about a volcanic ash plume that rose up to estimated 25000 ft (7600 m) altitude or flight level 250 and is moving at 20 kts in NE direction. Explosive activity continues. Volcanic Ash Advisory Center (VAAC) Buenos Aires warned about a volcanic ash plume that rose up to estimated 24000 ft (7300 m) altitude or flight level 240 and is moving at 05 kts in NE direction. Explosive activity continues. Volcanic Ash Advisory Center (VAAC) Buenos Aires warned about a volcanic ash plume that rose up to estimated 24000 ft (7300 m) altitude or flight level 240 and is moving at 05 kts in E direction.